Lightly roasting courgettes/zucchini with garlic and herbs brings out their sweet flavour without losing their naturally sweet crunch. I use a mixture of yellow and green courgettes/zucchini in this recipe but do just use green if the yellow ones prove elusive. Slice the courgettes/zucchini diagonally into bite-size chunks. Place in a bowl with the garlic, olive oil and some salt and pepper and toss together. Line a deep roasting tray with baking paper. Spread out the coated courgettes/zucchini, scatter over the cherry tomatoes and place the salmon on top of the vegetables. 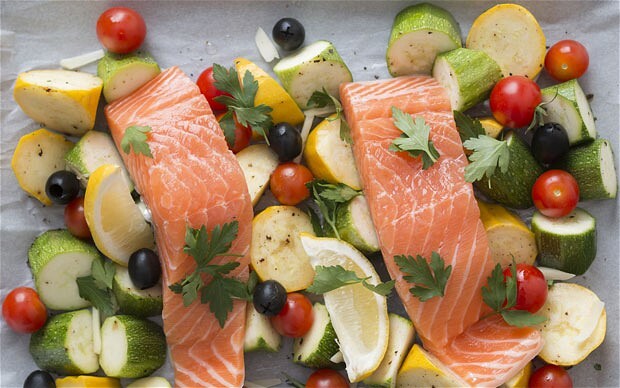 Squeeze the juice from the lemon wedges over the salmon and then nestle the wedges among the vegetables. Sprinkle over the parsley. Place in the middle of the oven and bake for 15 minutes until the fish is cooked through. Take the tray out of the oven, lift off the salmon fillets and leave to one side on a warm plate. Add the basil and olives to the tray and stir to mix through the courgette/zucchini mixture. Return the tray to the oven for 5 minutes until everything is warmed through. Serve the salmon on top of the vegetable and olive mixture. 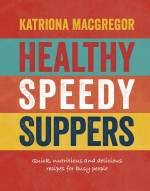 You can find more delicious recipes on Healthy Speedy Suppers by Katriona MacGregor. 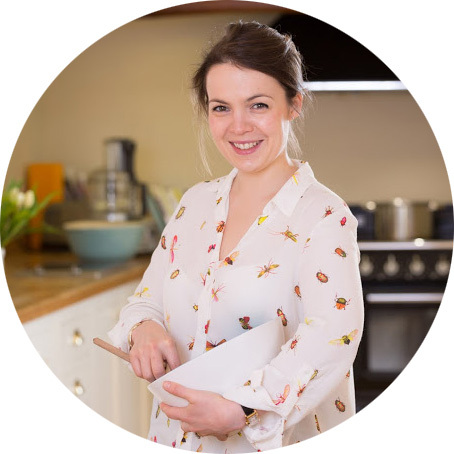 Katriona MacGregor is a chef, cookery writer and journalist who writes a hugely popular weekly column for The Telegraph. Her personal experience of stress, fatigue and autoimmune thyroid disease has lead her to create recipes that are simple to make but focus on good ingredients and wholesome food.